From the ashes of World War II emerged two victorious superpowers: the United States and the Soviet Union. At the end of the war, America in particular was left with exceptional military strength, a monopoly on atomic weapons, and a home front intact. In the below excerpt from The American Military: A Concise History, Joseph T. Glatthaar explains the development of the American military in the years following World War II. The United States emerged from World War II as the strongest nation in the history of the world. Never had one nation possessed such military and economic might. Its booming economy was essentially untouched by the violence, and it boasted an experienced military with a monopoly on atomic weapons. Over the next three decades, the United States promoted its vision of the Atlantic Charter, hoping to transform the world into its own image. Painfully, the United States learned that its economic and military power were finite, and since the 1970s it has struggled to absorb that lesson. Before the United States entered World War II, Maj. Gen. George Marshall had the Army create a manual on military gov­ernment, and in April 1942 he established the School of Military Government to train occupation troops. When the United States agreed to oversee one of four occupied zones in Germany after the war, the Third and Seventh Armies had knowledgeable personnel for the initial occupation and the removal of Nazi officials from positions of authority. Trained troops quickly assumed greater re­sponsibility for refugees, displaced persons, identifying and burying the dead, and administering services to the defeated population. In 1949, occupation ended when Britain, France, and the United States merged their zones to form the Federal Republic of Germany; the fourth zone, overseen by the Soviet Union, became the German Democratic Republic (East Germany). The war had pulled the United States out of the Great Depression, and many people feared a relapse when the war ended. To avoid a flood of returning veterans in search of jobs, the government passed the G.I. Bill, which offered them benefits such as free college tuition, a livable stipend for schooling, and low- interest home and business loans. The legislation eased the transition from a wartime to a peace­time economy and offered education and opportunity for millions who otherwise would never have had them, laying the groundwork for economic mobility. Neither the Truman administration nor the military had any intention of reverting to the late 1930s conditions in size or struc­ture. The administration wanted a military strength of 1.5 million, and the draft expired in 1947. To fill the dwindling ranks, Congress instituted a peacetime draft in 1948. The policy marked a dramatic shift from a military that depended on mobilizing citizen- soldiers to one that focused on readiness to deploy. The war highlighted some serious weaknesses in the defense establishment. Various intelligence- gathering elements, for in­stance, had failed to share information prior to Pearl Harbor. The government sought to rectify such weaknesses with the passage of the National Security Act of 1947, which established the Central Intelligence Agency (CIA) to oversee the collection, analysis, and dissemination of intelligence. For nearly three decades, the Army aviators lobbied for independence, and their contributions in World War II, along with reliance on the atomic bomb for defense, ensured the creation of an independent air force. World War II also demonstrated the complexity of warfare and the need for greater cooperation among the services. The Joint Chiefs of Staff (JCS) had secured collaboration among the services in planning, but battles such as Leyte Gulf indicated the need for better joint cooperation. The 1947 legislation made the JCS perma­nent and created a National Military Establishment under a secre­tary of defense to improve joint planning and operations. Finally, the law created the National Security Council, which brought to­gether the central players of national defense and security, such as the president, the JCS, the secretary of defense, the CIA director, the secretary of state, a national security adviser, and various cabinet members as needed. The legislation marked the beginning of a dra­matic shift of power in peacetime away from the State Department and to the military and national security sphere. It also paved the way for new military schools that emphasized joint operations, such as the National War College, and think tanks that brought in civilian experts to advise and solve problems. Featured image credit: US Army paratroopers by US Department of Defense. Public domain via Wikimedia Commons. Joseph T. Glatthaar is Stephenson Distinguished Professor of History at the University of North Carolina at Chapel Hill and is the author of eight books, including General Lee's Army: A History of the Army of Northern Virginia and Forged in Battle: The Civil War Alliance of Black Soldiers and White Officers. He has received many awards, including the Samuel Eliot Morison Prize for lifetime achievement from the Society for Military History. He is a past president of the Society for Military History. 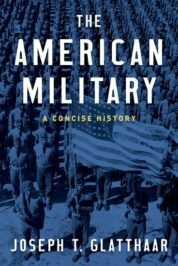 His latest release is The American Military: A Concise History (OUP 2018).